At the height of her career, Nisha Subramanian quit her job and went on a journey to better find herself and to reconnect with those around her. Nisha, who also has ADHD, talks about her initial diagnosis, the impact it had on her work, the revelation that her work–life balance wasn’t where it should have been, and how she became motivated to take control of her life, be grateful, and make progress toward her future. Prior to her ADHD diagnosis in 2012, Nisha remembers struggling with the administrative part of her technology consultant job – time sheets and expense reports – while excelling with its creative and project management side. Following her diagnosis and subsequent coaching, Nisha focused on improving in all areas of her job at which she felt lacking. She was rewarded with a promotion at the end of that year. Ecstatic after the promotion, Nisha nonetheless took a step back and realized most of her life revolved around her work. Nisha recalls a birthday lunch for her husband at which she was being snappy, snarky. Talking about it later, Nisha became determined to no longer be someone others saw as negative and unhappy. Eventually, Nisha decided she would resign from her position. As a child, Nisha remembers drawing, singing, and dancing a lot. She remembers being exceedingly shy in school – to the point of school not being the best experience for her. At home she would be more talkative. After her resignation, Nisha thought her life would instantly become better. In reality, she had a very tough time adapting to the change in pace and no longer having work to use as a shield. As a gratitude practice, each morning Nisha now writes down a short list of what she is grateful for. 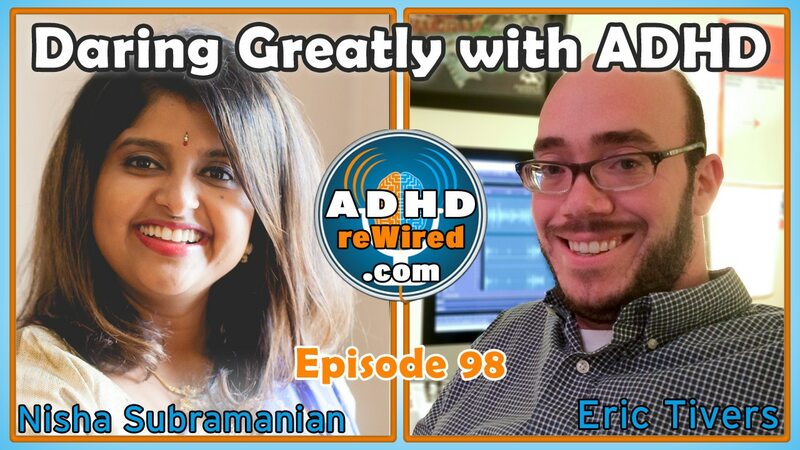 Eric wonders if the extra attention to detail that tends to be a part of ADHD might lend those with it to having an easier time being thoughtful and grateful for those details. Now, when friends from Nisha’s old job see her, they can hardly believe she’s the same person because of how much the practice of gratitude has changed her. Two years ago Nisha wasn’t able to talk or think like she can now about issues of mindfulness and gratitude. Brené Brown has given her the vocabulary to be able to do that. Nisha hadn’t heard of Brené until 2013 when she saw her on Oprah reading a passage from the speech Citizenship in a Republic by Theodore Roosevelt, which included the phrase “daring greatly”, also the title of one of her books. Hearing that passage brought Nisha to tears. At the time, she was still unsure if leaving her job was the right choice, but listening to that speech solidified in her the idea that she needed to make that change. Soon after quitting her job in 2013, Nisha began blogging at her site Nishnu.com. The initial idea of the blog was to focus on Nisha’s newfound “life outside the cubicle”. She would write about books she read, places she traveled to, life experiences, and more. One recent blog post was a story about how Nisha had been feeling grumpy and annoyed from both being sick recently and from her yoga teacher being absent. Highly critical of the substitute teacher, Nisha began to build up negative thoughts. When the teacher helped her with a pose, smiling kindly, Nisha realized how quickly and easily she had been lead to think poorly of the teacher. By the end of the class, Nisha was fairly relaxed. Eric notes how self-assured and confident Nisha seems – that no matter what happens next, she is confident in her self-worth. Nisha says that she hadn’t attained her current level of self-worthiness until taking part in the ADHD reWired Coaching and Accountability Group. One can know all sorts of tricks and methods to productivity, but having a feeling of self-worth can boost one’s productivity to another level. First meeting at a Brené Brown event, Nisha remembers hearing Eric talk about how Brené’s work had influenced and changed his coaching practice and being determined to meet him because of that. The interviews with other past participants in coaching groups, like Maria Billing in episode 80, also helped convince Nisha that joining one was the right decision. In the group itself, Nisha learned many strategies she has found multiple uses for in the time since. Nisha has learned to schedule time into her schedule for “breakdown” and clean-up following a project or activity. Also using timers to help her productivity, Nisha follows Eric’s TRIP idea: Timers, Reminders, Input, and Classes. Using star charts is one of Nisha’s favorite strategies: she created a booklet to track the building of habits like working out or meditating consistently. Be kind to yourself in the event your systems fail. Look at the positive side of the process and continue trying new strategies and systems. Referencing the book I Could Do Anything If Only I Knew What It Was, Nisha says the author, Barbra Sher, makes a point to not wait until you have absolutely all variables planned out before acting – it would take too long. At least taking a few steps in the right direction is always better than inaction. Referencing a talk Brené Brown gave called The Anatomy of Trust, Nisha notes how little time it tends to take for those with ADHD to arrive at a place of trust with each other. Eric and Nisha discuss the prevalence of people being absorbed in their mobile smart devices at theaters and other public spaces while out in groups. It could be distracting, if not disrespectful, for those on stage during a performance. Both also admit that they do much the same themselves. Nisha hopes good tool design will help people better maintain balance between using devices or not. Using applications that block certain functionality of a device is more successful for Nisha than telling herself that she is not allowed to use her smartphone. Despite knowing the benefits of abstaining from screens and technology before bedtime, Eric will still tend to use them anyway. Eric mentions Freedom.to, the internet blocking software, and Sleep Cycle, which has dramatically helped him wake up gradually in the morning. Nisha now has a greater understanding of what she likes and what she would like to continue doing in the future. Project management and working with others has always been a strength of hers, so she imagines she will aim to return to a job that focuses on that work. At the same time, Nisha has discovered she loves writing, singing, dancing, and acting – she would want to continue trying all of them going forward. In terms of her ADHD, Nisha’s outlook has been refined via coaching. Nisha: A big part of having ADHD is to recognize your differences and advocate for yourself. For the longest time I used to be mad at myself for being the way I am. Today, I’m much more adjusted. Will I throw a fit or start a fight with someone who makes a distracting noise? No, but that doesn’t mean it isn’t a problem for me. In terms of Nisha’s next prospective job, she mentions how Sari Solden, in her book Journeys Through ADDulthood, highlights the different variables in a given work environment. Having a structure that would allow Nisha to be creative and work toward her strengths, without being dismissed as “doing nothing” for two years, would be part of her ideal working environment.